Gambit: Stealth is the first in a two-part mini arc that ends on a bit of a cliff-hanger. 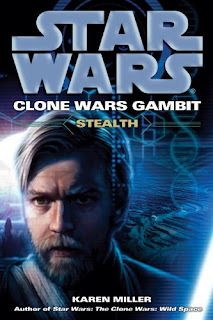 While the Lanteeb mission propels the action forward, the dynamic between Anakin and Obi-Wan is the strongest undercurrent of the novel. As Karen Miller reminds us, it’s rare at this point in the timeline for Obi-Wan and Anakin to run around together as they often did as Master and Apprentice. This realization is poignant when Obi-Wan considers his regret over Anakin; he wonders if Anakin ever really learned anything taught to him or if he’ll ever learn. He frequently reminded himself he was no longer Anakin’s Master--that old relationship is over, however much Anakin remains forever respectful of Obi-Wan. Miller strategically removed Ahsoka from the narrative. This helped move us away from just seeing Anakin as a Jedi Knight (with a Padawan) to consider his new role and relationship with Obi-Wan. The two can now face each other as adults, so to speak. Anakin’s undergone his right of passage and, while not an equal yet, is able to meet his former Master’s gaze without the guilt or shame associated with having done something wrong. Obi-Wan’s displeasure is the least thing from his mind. On this new, more level playing field, their dynamic comes to us as a war of values and beliefs. Obi-Wan is the consummate, duty-bound Jedi: cool, professional, objective, detached. Anakin is demonstratively compassionate, always willing to help someone in need; his emotions are close to the surface where Obi-Wan’s are tightly controlled. Anakin always feels the need to be involved. I think what Karen Miller does best--what she showed us in Wild Space--is her talent for creating character studies by placing two disparate personalities together and seeing what happens. In this case, two very different Jedi--one raised traditionally, the other not--ultimately come head-to-head in an argument fundamental to the the job description. Obi-Wan learns quickly that old habits die hard. As he fights the urge to teach lest he offend Anakin’s sensibilities and abilities as a Jedi Knight, he also works to understand the qualities in himself that have made him so different from his former Padawan. I loved the phrase Miller uses when she reminds us, “Obi-Wan Kenobi was a far more complicated man than a first glance would suggest” (p. 386). We learn, too, the dimensions of Obi-Wan’s psyche that are just as warm and inviting as Anakin, but honed through years of rigorous discipline growing up surrounded by other Jedi. Obi-Wan’s emotions are always checked by caution and propriety, but that doesn’t mean he doesn’t have them. He just deals with them differently. Karen Miller helps make this obvious through many touching scenes where Anakin is characteristically tormented and driven by his feelings, watched by Obi-Wan who must always remind him that the first thing about being a Jedi is prioritizing. The two have never been more different, have never been more in tune to each other’s strengths and weaknesses. Miller captures their relationship wonderfully. They banter and feed off each other’s unspoken body language; they disagree and argue over intentions and dogma. Ultimately, they’re very respectful of each other and mindful of the consequences each action or word may bring. I was impressed before with the fresh perspective Miller brought to the Star Wars universe. With Gambit: Stealth she reminds readers what she does best is unearth the mechanics that drive characters like Obi-Wan to act as he does. I don’t think we could ask for a more staunch supporter of such a wry manipulator. As pleased as I was about this book, I am curious about one thing: if Star Wars has skittles, does that mean they have Starburst or Twix bars, too?